President Trump's lawyer Rudy Giuliani said on CNN's "New Day" Friday that the special counsel agreed to only ask questions about two topics. Rudy Giuliani says special counsel Robert Mueller has agreed to narrow the subject of his questions if he gets the opportunity to interview President Donald Trump. Giuliani, who's one of Trump's attorneys, told The Washington Times, "[Mueller's] eliminated a lot of subjects that would have indicated he was fishing." Giuliani didn't go into much further detail while talking on CNN's "New Day" Friday, but he did note Mueller agreed to only ask questions about two topics. According to Giuliani, Trump won't be asked about his personal attorney Michael Cohen, who is currently under investigation for some of his business dealings. 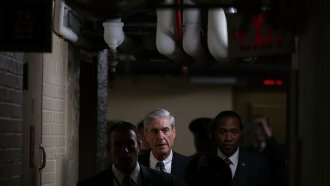 Related Story Mueller Investigation: One Year Later, What Do We Know? The New York Times reported last month that Mueller had a list of almost 50 questions for Trump that covered a wide variety of topics, including his businesses, his firing of James Comey as FBI director and even what occurred while Trump was in Russia for the Miss Universe pageant in 2013. Since joining Trump's legal team, Giuliani's been working as a liaison between Trump and Mueller. Giuliani's allegedly told the special counsel that while Trump is still opposed to the idea, a future interview isn't off the table.